“The sun was beating on my back, as sweat poured down my legs and my iPhone continually beat against my leg in the pocket of my jacket tied around my waist but I was not going to stop. I was determine to finish under an hour if I had to hop on the next person’s back and cheat my way to the finish line. 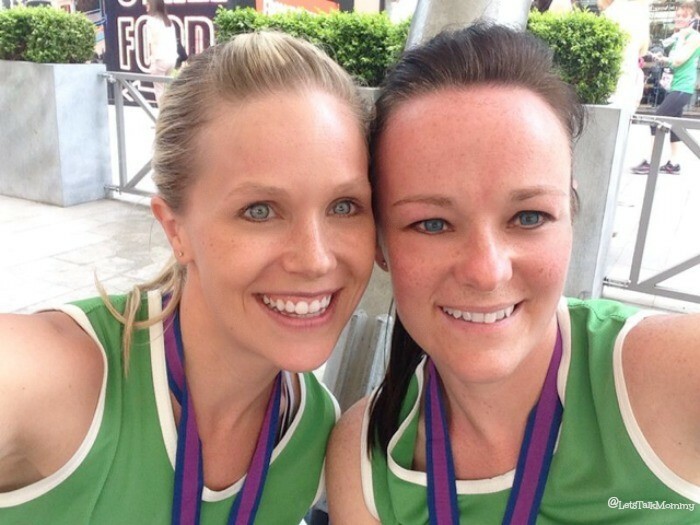 On Sunday, I ran the Bupa Manchester 10K Great North Run with my best friend. I have done one before but this time I had a set goal in mind. I was a bit nervous for the forecast which said, “Hot!” Only in England would it be hot on the day I wanted to attempt my best time on a 10K run. If you know me then you would say, “always your luck.” So true. It was the perfect day in so many different ways. I waved my kids and hubby goodbye with a few good lucks and my best friend and I hopped on the train to Manchester. (we missed our initial train, chatting too much, yup, that’s us, good thing we made our start time). By 11 am it was already warming up, the pavement was steaming below us as we made our way to the start line to do our warm up. I was pumped and my energy was high! We were off. The atmosphere was loud and buzzing which was great. It felt like everyone in the crowd was cheering you on as well as their loved ones participating. It was hard to find a good pace with people flying by you and others stopping right in front of you to walk. I have never experienced anything like it. 1K – I took in the atmosphere around me and chatted with my bestie and all the things that I passed along the way. 2K – I high fived my bestie goodbye (I know bad bff!). But it was a great moment together. 3K – I enjoyed the entertainment with bands playing all around me, pacing my step to their upbeat tempos. 5K – I was high fiving all the kids on the side lines as I ran passed, it was the half way mark who wouldn’t get excited about that. The kids’ faces lit up every time a racer clapped with them. 6K – There was a shower somewhere just after the 6k mark, I think I may have elbowed a few people out of my way to get in it as if there wasn’t enough for everyone. Competitive I know! I can’t help it. 7K – My knee went at about 7.5k, I may have went to a happy place for the next 1k to get used to the pain, it all seemed a bit fuzzy at first. 8K – I caught three kids on the side lines cheering on their mother and father running while sat with their grandparents, holding signs saying, “We love you”. Talk about a melt your heart moment. 9K – I had a slight urge (ok huge urge) to run to the nearest pub and pretend I finished. One runner even asked if I was okay as I was limping by this point. (embarrassing). I probably could have walked faster. 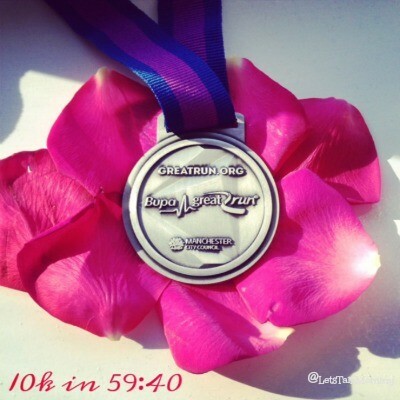 10K – I could see it in my blurred vision, that pesky white line on top of the hill. (really? finishing on a hill in the heat, what were they trying to do to me?) I heard the annoying announcer shouting for everyone to slow their pace down. It’s the finish line, NO ONE slows down. I dragged my right leg as fast as I could and mentally knew my right foot had the chip on it and threw it first over the line. Finish Line – I DID IT!!! As I gasped for air and looked around for my partner in crime, I saw other runners finishing, their face red from the heat and straining to finish. I glanced over to one runner in particular and just as she was about to finish over the line she dashed to the side scooped up her baby girl and finished with her in her arms! I almost seriously cried. It was the sweetest thing I have ever witnessed. Even now, I close my eyes and see her baby girl reaching out for her with the biggest smile. What a great finish way to finish! The best thing about being a blogger is how much it changes the way you see the world. Before, I was a blogger this run still would have been magical and a great accomplishment but doing it as a blogger it was so much more for me than that. I would have never taken in all the above at each marker before. Now, wherever I am and whatever I am doing, I take so much more in. I take in my surrounding, looking at things with an instagram eye whereas I normally wouldn’t have noticed the little things as much. I sit back and observe people more, observe my kids more, and the world interacting around me. My thoughts become tweets now, voicing them out loud or sometimes something will sparked a blog post. Like while running on Sunday sparked this very post because as I was absorbing everything around me, and I realized before blogging I would have never focused in on what I saw each step of the way, the music, the other runners, the atmosphere, etc. I would have just enjoyed it in the moment and that moment would have just passed by, to become a good day. I really do see everything so differently now. Every aspect of my life has become posts in my head, ready to share my experiences with the world. While I am experiencing them I now have a voice telling me to look around me, what do I see, hear, feel? It’s like it’s made me appreciate life so much more, opened my eyes to the true beauty of life, and all the smaller great things in it! As I was running, I kept thinking how much happier I have been since I became a blogger. When you start to see the world through positive tweets, pretty Instagrams, encouraging Pinterest boards, and inspiring blog posts, the negative things fade away. I have always believed positives attracts more positives. My best friend is also a prime example of this, we are both very positive and we have so much fun together because of it. Our day started out with a great run, literally, and turned into a best friend day to remember. One filled with my first taste of english passion fruit cider, shopping, lunch, and quality time with my partner in crime. Always planning our next adventure together. Blogging really has made me see it all differently now! Well done you. So glad that you did it, limp and all!!! I did limp bad towards the end. lol I so agree, I am a positive person but blogging seems to have taken me to a whole new level and I love it all! I finally found my little passion in life and feel so complete with everything right in this moment of life. Well best of luck you will love it. I have done the race for life before it’s great. Thank you! Me too, as I am really getting into my running and I love the atmosphere at them too! So many supporters. Great charities to do them for too. I am so worried my knee is gone and thats it no more running at 30! Boo. Yes I can’t believe how much more I take in and stop to remember little things now. It’s great. Well done, you! What an achievement. I’m with you on the blogging front. I love all the pretty photographs and the lovely stories – I’m not naive enough to believe that life is always like that but it makes me happy to know that there’s so much nice in the world. It’s inspiring and makes me want to make my everyday that much nicer too. Thanks Sam, glad others see it how I do, which I figured. I am so glad I started blogging only wish I had started years ago!!! It really has changed so much for me. Thank you so much Lucy! I was so excited when I got my results. Blogging really has changes my life for the better!!! Congratulations on a great finish! Especially running through pain! I think writing about an event does make you process it on a deeper level than if you just experienced it and never had to describe it in words. I’m sure years from now your blog posts will bring back many memories that you would have otherwise forgotten. I hope you are right. That’s why I started blogging to record the little things that are great things to remember but may be things we might forget not just about my kids but about myself and our life together! Thank you. I was so excited to get my results in under an hour. My knee is a big problem. I don’t think my run days will last very long and sadly I was just getting to love it so much. Thank you so much. It truly has changed the way I look at things and the way I feel about things. In a positive way. I love PMA what a great saying! Thanks hunny yes those pesky hills are a major killer. My knee can’t handle them anymore. Just glad I pushed myself and got my time I wanted. I am satisfied now. Hahahah now I just need to jump on this juicy band wagon. Love it. Glad you love it too. It really is such a great hobby and career if you can make it into one too. Either way blogging is a very rewarding and keeps all my memories in a place to share time and time again. I totally know what you are talking about with this! Blogging really does make you look for the pretty, fun, weird, interesting, quirky, amazing whatever in everything you do! Thanks for the tip. Didn’t know that. Good one though. Rice! Know now. My thirty year old body just ain’t what she used to be. Lol yes it really just makes you remember more of everything to share later. Things you might otherwise just glance at and move on from. Life littl things not to miss now. Loving it. Thanks Jocelyn. Ya I was surprised at how much I noticed the little things now and see things in an Instagram photo or as a new Pinterest board idea or blog post. Using my creative side a lot more these days I love it. Firstly – well done to you and for pushing through the pain! Secondly – I totally agree with what you say about blogging eyes. It completely alters your perspective on everything. It does doesn’t it Sian? I can’t believe how much has changed in my attitude and the way I look at things now since blogging. I was so lonely in another country while everyone else seem to have family friends and hobbies to keep them busy. Now I do too! Huge congratulations for completing the race – even more so in the heat! Thank you Emma. It wasn’t easy considering the heat. But still was a fab day and got to really make the most of it with my best friend!!! I haven’t done many, only three in fact but I did appreciate everyones efforts to support so many great charities. Thanks Denise!!! Me too only 8 months now but it has been a grand adventure I will say that much! Amazing!! Glad you are enjoying it too! It was a teary moment for sure!! But it was such a great experience. I love how running let’s me think of so much at the same time. Letting my mind race with ideas! 5K is great too Fiona. I am not a natural runner so 5K 10K they are all hard for me and not something I would do often! Lovely post. Well done on your 10k. I totally agree with you about blogging, it does make you think about things differently, focus on all the good little things in life, which sum up to be great. Thank you Karen. Yes it really does. I can’t imagine life without blogging and all of you supporters now. A whole new circle of friends to share passions with and stories together. So lovely. Thank you so much Jess. It was definitely one of my favorite posts I have wrote too. Glad someone else liked it too. Yes my next challenge hmmm not sure what it will be but I always have something going on. Lol never a dull moment in the life of let’s talk mommy. I agree, everyone is definitely so very friendly. Its a great community feel and so supportive to be a part of. Thank you so much hun, knee is still out but hoping it will heal with time. 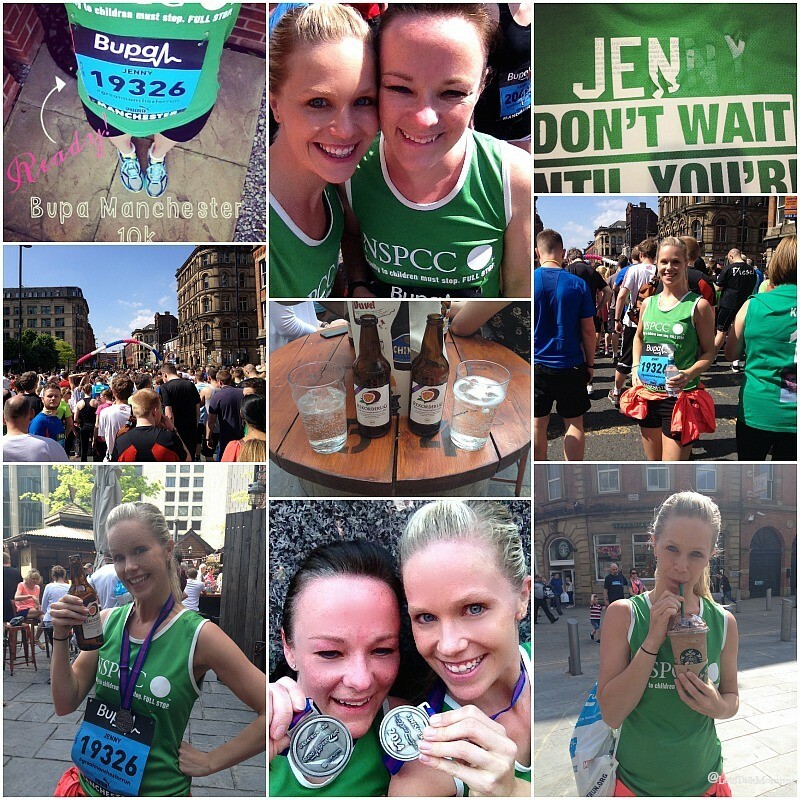 Well Done Jenny, what a great run and a great post. Your so right about how blogging changes how you look at things! Thank you, it was a great achievement and one to cross off my list now. I would have said the same thing until I started running the end of last year. Just wish my 30 year old body wasn’t giving up on me already. I was just starting to love it. Never thought I would say that either. Wow 5k in 22 mins that’s amazing. Ya hard if your son is outbeating you. lol I would love to be able to run faster and farther but my knee usually gets in the away of that. Well done Jenny, you did so well. A few of my workmates did it too and we’re telling me how hard it was, so you made an amazing time! Thank you so much Jo. It felt really good to finish under an hour. I was so excited. Yes blogging definitely has given me more positive outlooks. That’s great to give yourself targets to work towards. Race for life is great too. I did it a few years ago. You would love the atmosphere. Well done for finishing! I so agree with you about blogging changing your perspective, helping to see the little moments that make such a difference. A happier sunnier life! Thank you and I couldn’t agree more definitely a happier sunnier life. Congrats for doing the run. I’m always in awe of people who run because even at my fittest I definitely wasn’t a runner. Blogging does do strange things to people – definitely makes you look for the little things to record and remember. I am just glad I have somewhere to record the little things. This old brain aint’ what she used to be and I know I wouldn’t remember half of the things I write down. So I am so glad I have a space to do so and come back to time and time again. Thank you ever so much for the lovely comment Katie. You are so sweet. If I am honest I think it’s my all time favorite post I have ever written too! 🙂 Because it is so me in every way and in every new way too as I have changed so much becoming a mother, and a blogger and a runner over the last year. Thank you hun!!! It felt good. That’s so sweet you do it together. Making great memories there. Thanks hun. It’s funny how something can change your perspective completely on everything. I love it. Thanks hunny. I am not a very good runner and don’t do it often enough. Just need the knee to heal first before I get back to it. Thanks for commenting and stopping by. Yes blogging definitely has helped me in so many ways. Way to go! I can’t imagine how tiring it must be run a 10k. I did too at first but a few friends got me into it. Now I can’t stop. hahaha Although my knee has stopped me for awhile. Boo. I love the way you wrote this post, I could imagine seeing it all with you. Congratulations on completing your run and I hope you knee is ok. Thank you so much. My knee is knackered and even had to visit the doc it was that bad. Hope to get it back in action soon.